Dr. Nichole Huntley is a Mazuri nutritionist and formulates diets, conducts research, and provides technical support for our team. Nichole has bachelor’s and master’s degrees from the University of Missouri in animal science where her focus was on ruminant and comparative nutrition, and her thesis studied nutritional solutions for iron overload disorder in black rhinoceros. She then completed a Ph.D. in swine nutrition at Iowa State University. 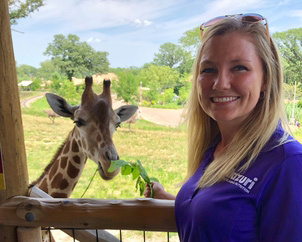 Nichole’s primary interest has always been on exotic animal nutrition and she has worked in the nutrition departments of Omaha’s Henry Doorly Zoo, the Saint Louis Zoo, and the Smithsonian National Zoo.